Senior Deserea Walker plays defense against Huntsville in the area tournament. The team defeated Huntsville to advance and eventually clinch the championship. One hundred wins can encapsulate an entire career of a high-school sports player.The senior class on girls basketball is now underneath that umbrella with their nail-biter win over Buckhorn on Friday, being their 100th win. 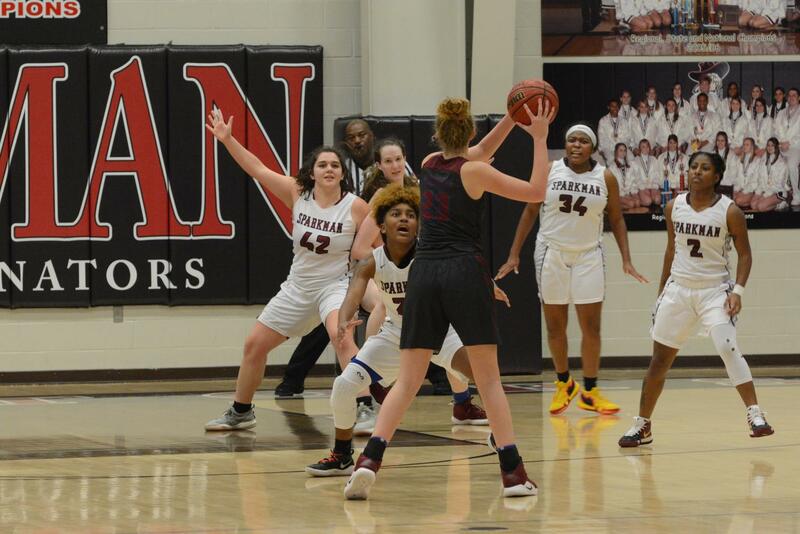 With about 140 games that can be played by a basketball player in a ASHAA-regulated career, that means that a girl basketball player must have a 71.3 percent winning percentage with their team to achieve 100 wins. “We get real competitive and we pulled out a great win against Buckhorn. We do still have a lot to work on if we want to get to the championship game,” senior Deyana Dodd said. As the season cools down the team is red-hot and looking to go back to the state tournament, and win. However, the team recognizes that they still need work. With the end goal approaching fast, the girls say they are ready to face whatever the game throws at them. “With our senior girls getting their 100th win, it shows how good we are, but we still have a ton to work on. We have to get aggressive on the ball and really start focusing,” head coach Patrick Delay said. The seniors know they have to work on their abilities, but also appreciate the time they have remaining as a Senator. Delay said that the nine seniors we have fill in the roles and do the work so the younger kids can learn. The seniors know that they have to let the next class step up to the plate and shine. “All of our seniors are leading the team to where they need to be. Playing good defense and letting the younger girls shine through and make plays,” Delay said. It was only last year when the seniors went to the Final Four, falling to McGill-Toolen in the first round. The are looking to get to the final four again, but this time moving on to the finals. With the season ending, the girls basketball team is keeping strong and is looking to go to best their past selves. The squad has had at least 21 yearly season wins since Delay started coaching in the 2012-2013 season. “Our girls really contributed to all of these wins, they work themselves so hard and this shows it. They really try their best and try to be selfless toward the younger kids so they can have their moments too,” Delay said.